The native Indian automotive giant Tata Motors has been teasing Indian buyers with news related to the automatic version of the Safari Storme Sports Utility Vehicle from past one year or more. An enthusiast has recently revealed a spy image of the upcoming Safari Storme Automatic which was being tested. To the surprise of all, the test mule was not at all wearing any camouflage and it clearly indicates that the official debut of the model is very going to happen soon. 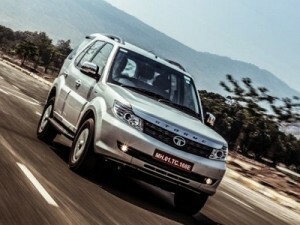 Tata Motors has made some remarkable changes to the exterior body of the upcoming automated version of Safari Storme. The rear windshield was having a sticker saying ‘Storme Automatic’ and it has clarified the fact that the test mule was the upcoming edition of Safari SUV. The current edition of the Safari Storme comes powered with a 2.2 litre engine that is capable of producing around 148 PS power at the peak along with 320 Nm of torque. Engine comes mated to a five speed manual transmission gear box by standard. The automatic version of the model could get slight increase in the power output most probably. As per the information, the automated variant of the Safari Storme SUV is going to get powered with the powerful VARICOR 400 engine most probably. We can expect the respective engine to deliver around 154 bhp power at the peak along with 400 Nm of torque. Engine may get mated to a six speed automatic transmission gear box by default. The same engine and transmission mechanism is likely to be used in the upcoming Hexa sports utility vehicle which is in concept form so far. It is also informed that the 6 speed automatic transmission gear box was adopted borrowed from General Motors. With increase in power output and also by offering a wide range of exclusive features, the upcoming Safari Storme Automatic is expected to give a tough fight for rival models such as Mahindra Scorpio, XUV 500 and Toyota Fortuner etc. This entry was posted in Autos, News on May 28, 2015 by UdutaHK.